In trading card game Magic: The Gathering, red focuses on speed and direct damage while blue emphasizes control, countering, and draw power. Although the two colors may oppose each other in the game's lore, they form one of my favorite combinations when combined. With red's focus on instant destruction blending with blue's long-term power, the duo prepares for any situation with a plethora of potent spells. 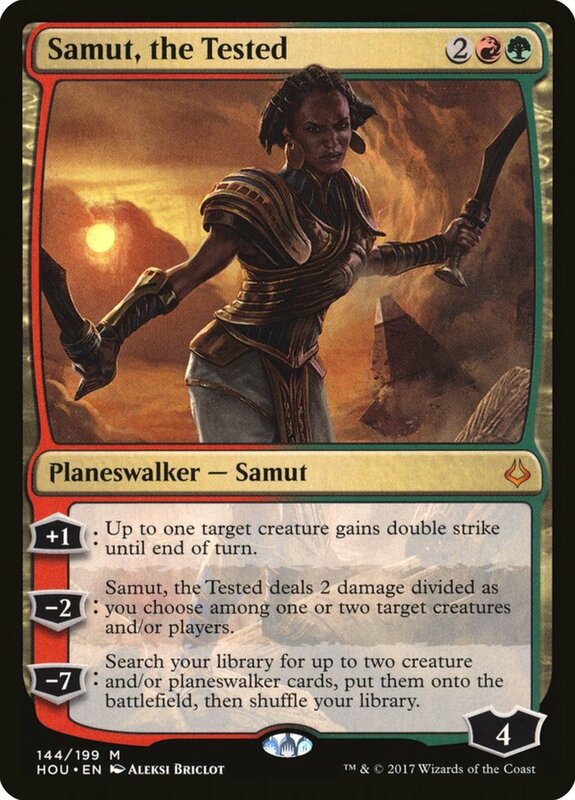 But don't take my word for it; see for yourself as we examine the ten best red and blue cards (excluding planeswalkers who would dominate the list) in Magic: The Gathering! First up, an aura enchantment that attaches to one of your creatures similar to artifact equipment cards. Clout of the Dominus only costs a single mana and it accepts either blue or red (generated by Island and Mountain lands), making it ridiculously easy to play. If the attached creature is blue, it gets +1/+1 power and toughness as well as shroud, preventing it from being targeted by other spells. If it's red, it gets +1/+1 and haste, letting it ignore summoning sickness and tap or attack the turn it hits the field. A 2/3 creature for only three mana is already a decent deal, and Jori En comes with two additional bonuses. 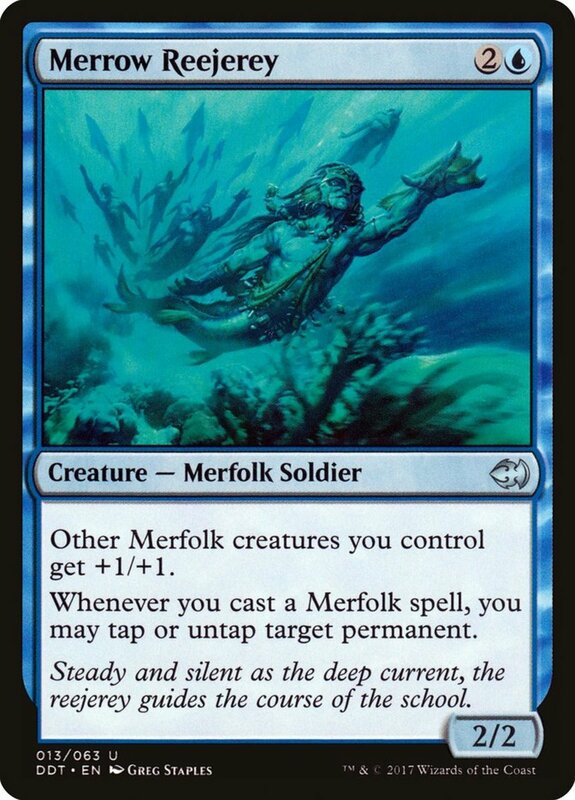 First, it belongs to the popular merfolk and wizard creature types, strengthening many type-dependent effects. Even better, whenever you cast your second spell in a single turn, Jori lets you draw a card, ensuring your hand always remains stocked. 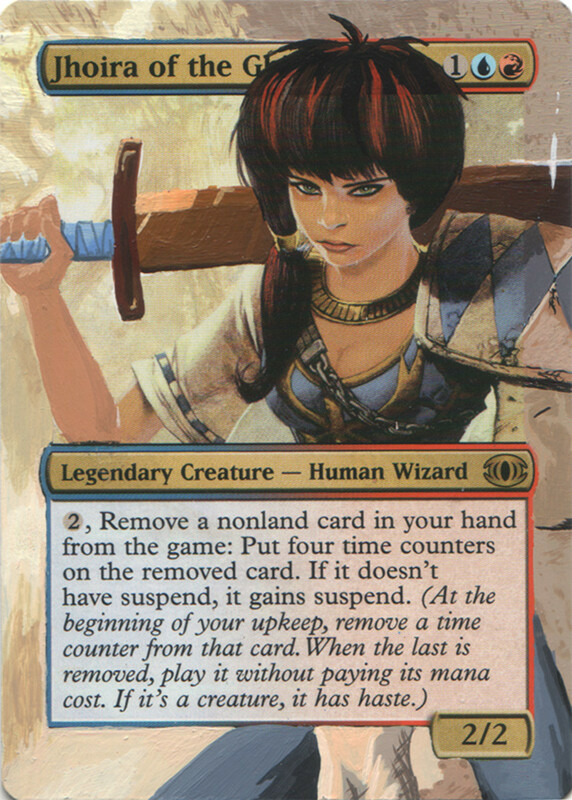 Additionally, note that Jori is a legendary creature. 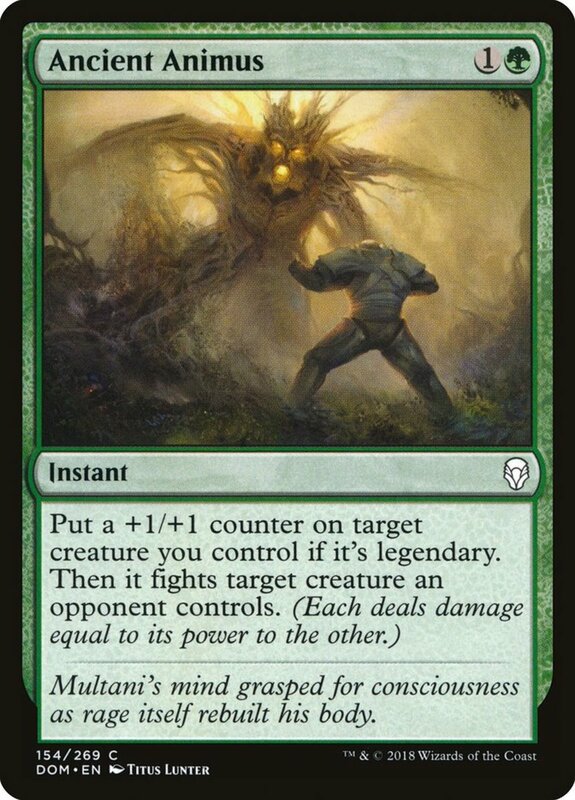 This means in can serve as your commander in EDH format, but as per the legend rule, remember you can only have one fielded at a time lest you be forced to sacrifice a duplicate. 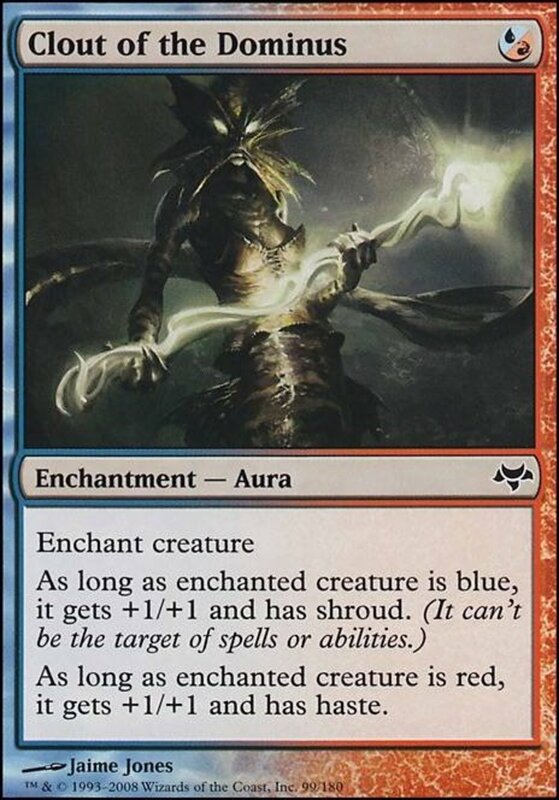 Another red/blue creature, Melek, Izzet Paragon only arrives as a 2/4, rather low considering its considerable mana cost of six. However, it counts as a wizard and provides some astounding instant/sorcery support: you play with the top card of your library revealed, and can play it as if it were in your hand if it's an instant or sorcery. Plus, whenever you play a card this way, you copy the spell, essentially letting it resolve twice and double its effects! 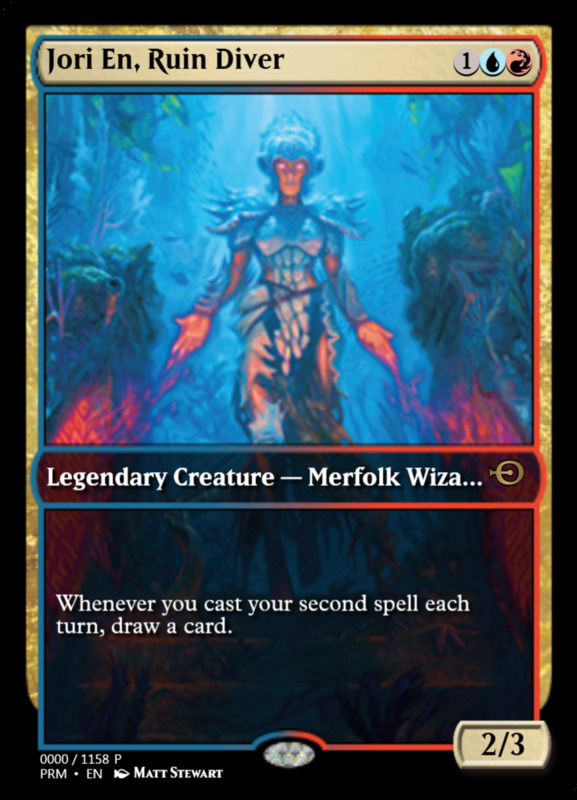 Since blue in particular houses some of the best sorcery cards, Melek's ability is a must for instant/sorcery-focused builds that rely on one-off effects more than permanent placements. Dominus of Fealty provides a handful of benefits to your deck. 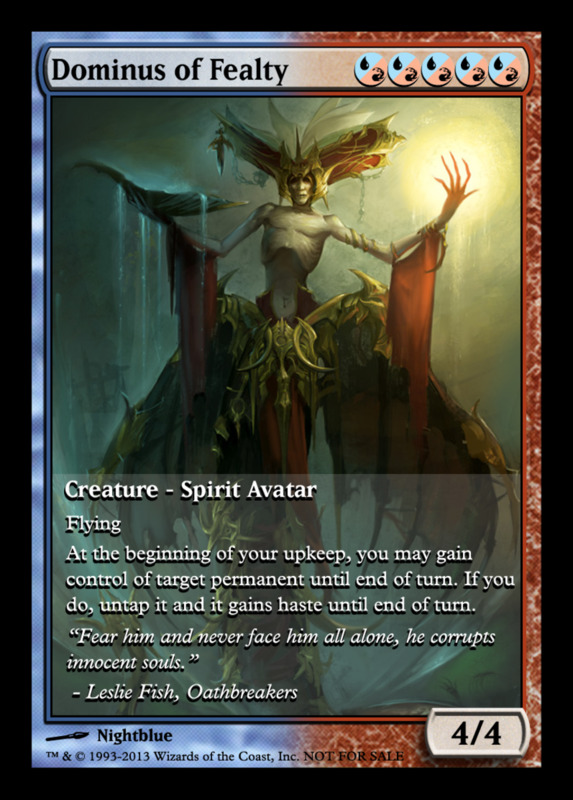 First, all five of its mana demands can be fulfilled using either red or blue mana. Then, it arrives as a decent 4/4 with flying, letting it soar over ground blockers. But best of all, at the beginning of your upkeeps (the starts of your turns), Dominus lets you gain control of a target permanent until the end of the turn. 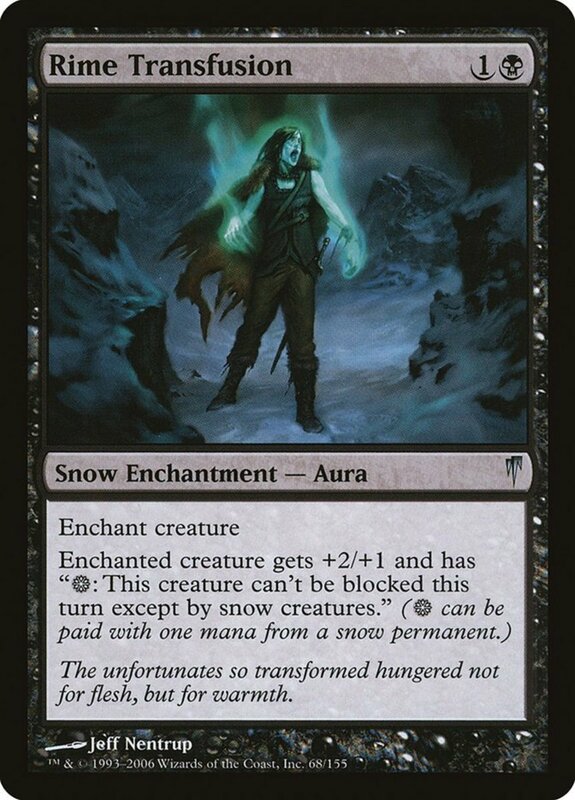 This can steal anything, from lands to creatures to even planeswalkers, and since the permanent is untapped and given haste, your opponent won't be able to thwart your efforts by simply tapping it during their turn; anything without hexproof or shroud is as good as yours. Finally, since Dominous isn't legendary, you're able to maintain multiple copies on the field at once. Another creature belonging to two popular types (human and wizard), Jhoira accesses even the most costly of spells with her stupendous ability. 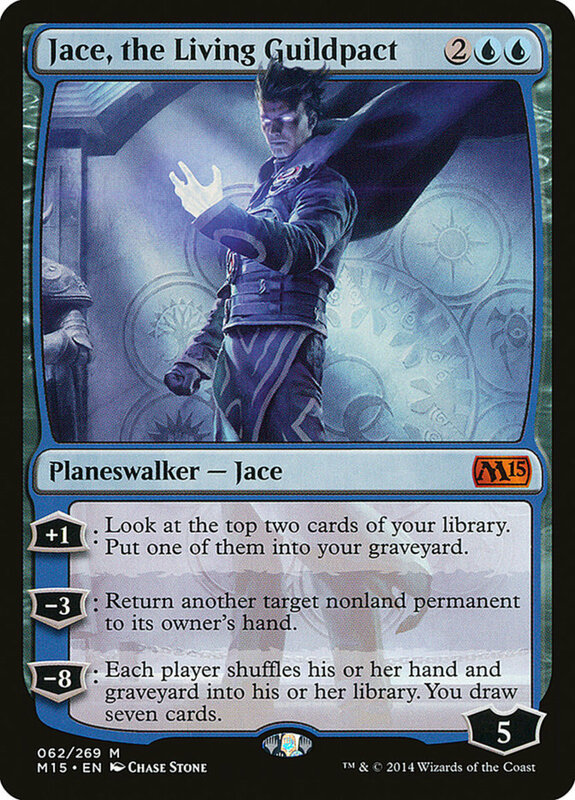 By spending two mana of any color, you can suspend any nonland card from your hand with four time counters, meaning it'll resolve (without having to spend mana on it) on your fourth turn after suspension. 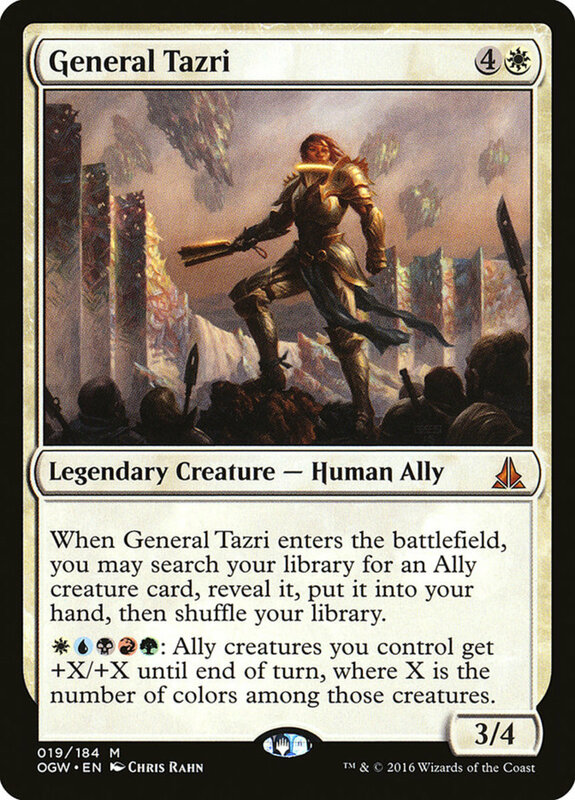 Although you'll have to wait for the effects, you'll get to play some of the most expensive cards (like Expropriate or the eldrazi monsters) without having to desperately ramp to meet their costs, and when the card arrives, it gains haste, ensuring creatures join the fray ready for action. Finally, remember the ability can suspend multiple cards at once (if you have the mana) and activates at instant speed, letting you use it during your opponent's turn and making them wait before discovering which card you intend to suspend. Kraum functions almost as a boosted Jorin En. It costs two more mana, but arrives with better stats (4/4) as well as flying and haste. It also belongs to two more-obscure creature types, zombie and horror, and its two-spell-a-turn draw actually activates whenever your opponent casts twice in a single turn, not you. 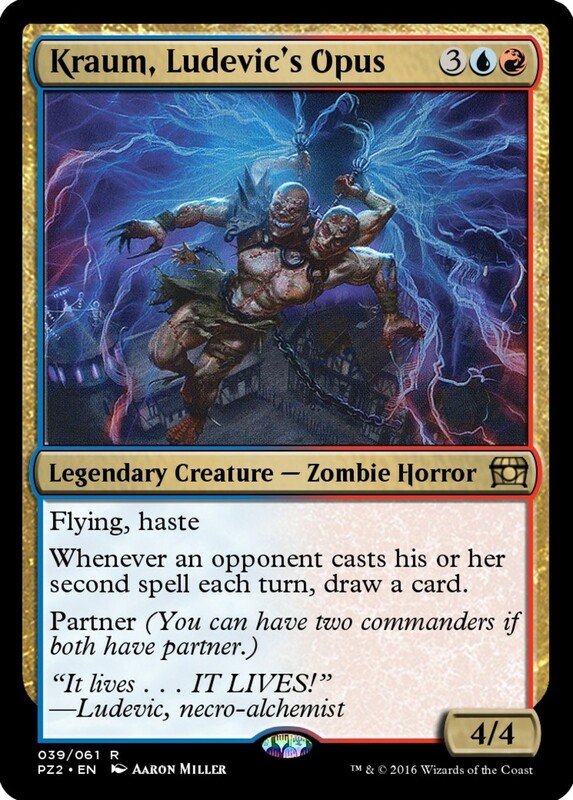 However, Kraum also possesses the coveted partner ability, letting you use both it and another creature with partner as commanders in EDH format. Partner cards are severly underestimated; having two generals lets you access more colors, predict the mana costs you'll have access to, and always have an additional unit at your disposal. Formidable on its own, deadly when paired, Kraum more than earns a place in this countdown. 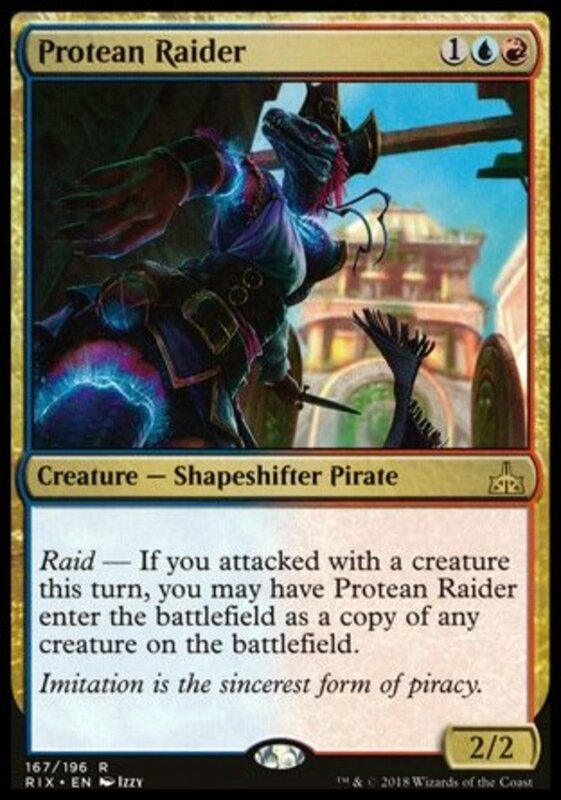 Protean Raider follows the Ixalan expansion's main theme: attack bonuses. In this case, Raider's raid effect states that as long as you've attacked with at least one creature the turn Raider is cast, you can have it enter the field as a copy of any creature. When using this card in my decks, with just three mana and a small stipulation, I suddenly have a clone of the strongest creature on the field, whether it's mine or my opponent's (don't forget the legend rule), and since the effect doesn't target, even shrouded or hexproofed creatures can't avoid having their DNA spliced. And while I won't normally want to cast Raider in its base form, it counts as a shapeshifter, belonging to every creature type and easily boosting any type effects I employ. As a final bonus, Raider is one of today's most inexpensive cards; you can often snag one for under a dollar! 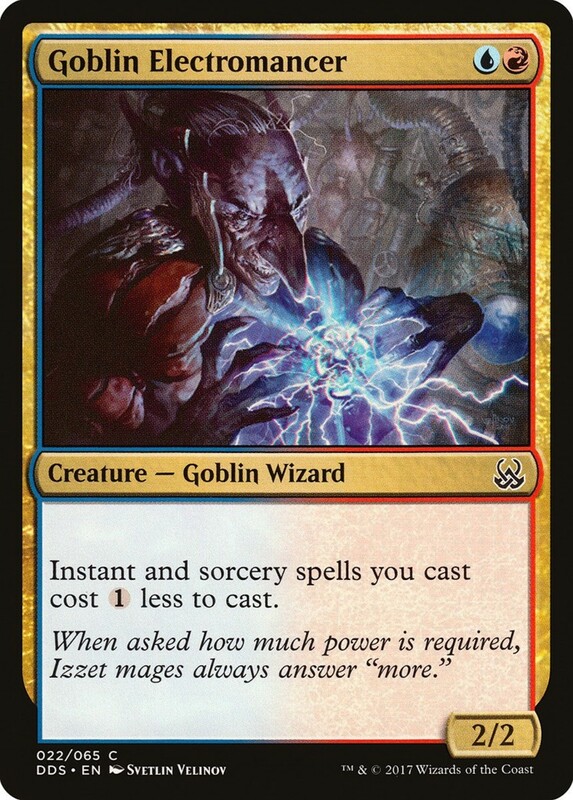 Goblins are likely the most popular creature type in red just as wizards are in blue. Combine the two with Goblin Electromancer, who already impresses with his twin types and 2/2 stats for just two mana. He also comes with the amazing perk of reducing the mana costs of instant and sorcery cards by one, letting you quickly play your best game-changers. 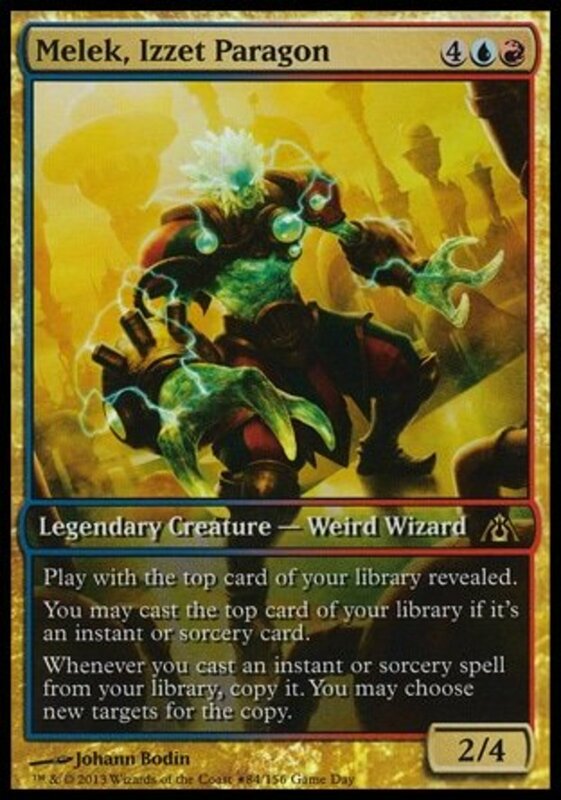 Red and blue aren't known for mana ramp like green is, but with creatures like Electromancer around, you can easily catch opponents off guard with the speed at which you utilize your strongest cards. 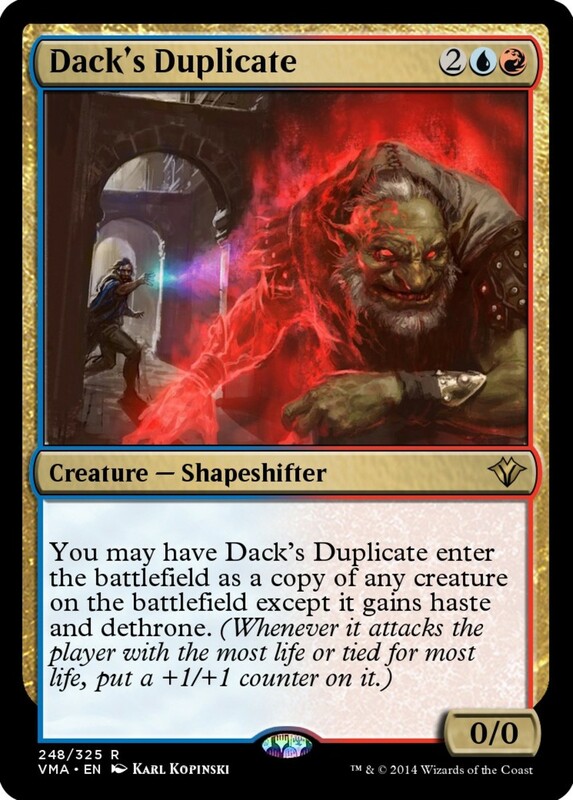 Protean Raider offers amazing cloning capabilities for three mana, but players willing to spend just one more can enjoy the numerous strengths of Dack's Duplicate, arguably the best clone in the game. It doesn't have Raider's raid trait, so you can utilize it as its fullest even without an attack, and it shares the same awesome ability of entering as a copy of any creature on the field. However, Duplicate also adds haste and dethrone to that creature's traits, letting it attack immediately and get a +1/+1 counter whenever it attacks the player with (or tied for) the highest life! Overall, a creature able to copy the strongest unit without targeting while improving their abilities—definitely a keeper. If for some strange reason you have Duplicate enter without copying anything, it's a shapeshifter just like Raider, letting it count as each creature type, but unless it enters with boosted stats, it'll die thanks to a base toughness of zero. The god cards always impress, and the God of Storms is no exception. 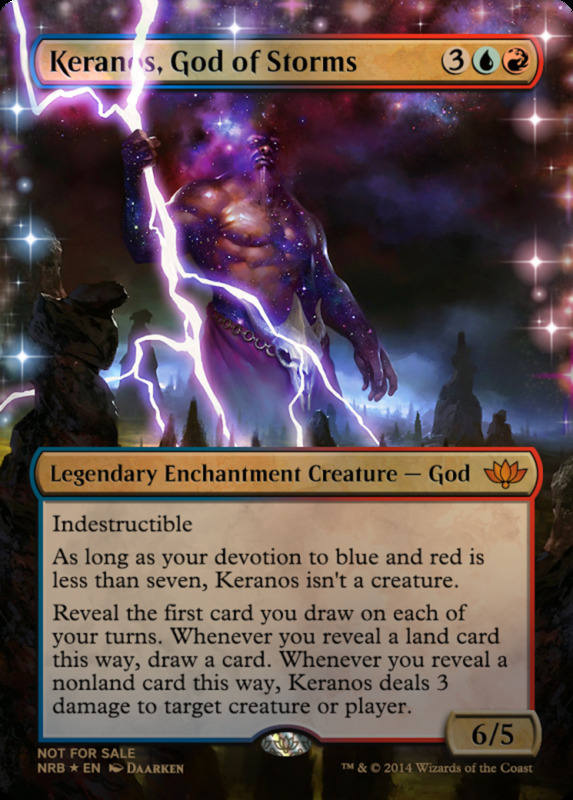 Although he doesn't count as a creature until your red and blue devotion hits seven (meaning you have at least seven red/blue symbols in the mana costs of permanents you control) and can't attack or block until he does, Keranos provides his effects whether a creature or not. You reveal the first card you draw on any turn; if that card is a land, you draw another card, and if it's a nonland, you inflict three damage to any target creature or player. Extra draws and damage speak for themselves; be sure to draw cards on both your and your opponent's turns to continuously heckle your foe with these traits. 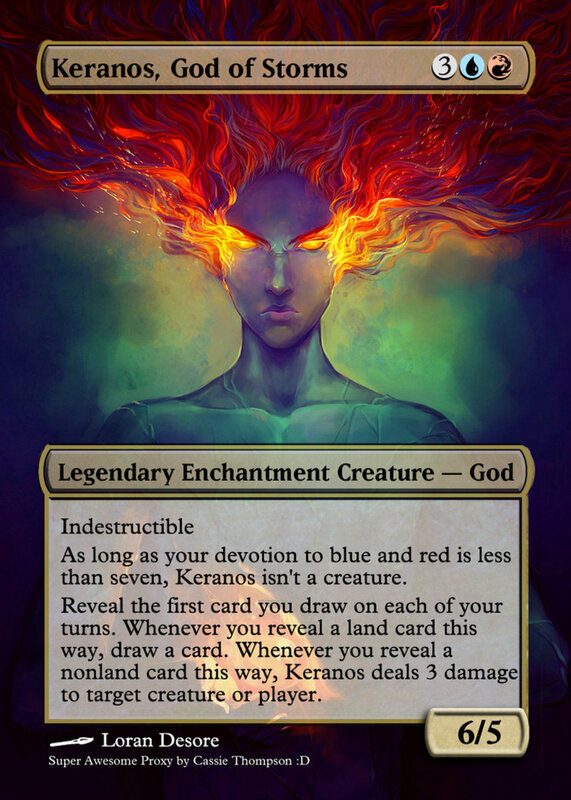 Keranos is also indestructible, making it incredibly hard to remove him, and when he's acting as a creature, his 6/5 stats should overwhelm most foes in battle. These cards will more than hold their own in any duel, but be sure to browse the online Magic card database to unearth even more red and blue treasures. With an incredible array of multicolor options plus each hue's individual strengths, red and blue remains a competitive combination that forms form of the game's top decks and will frequently seize victory in the right sorcerer's hands. But for now, as we eagerly await more cerulean and crimson cards in Magic's next booster set, vote for your favorite entry and I'll see you at our next MTG countdown!